Zesty, Salty, Spicy – Yuzukoshō! Green citrons and green chili peppers are in season, so now is the time to make yuzukoshō! A little of this flavor-complex condiment adds a whole new dimension to noodle dishes, dressings, meat dishes, and – as we’ll show you in the class – even dessert! That dessert, by the way, will be part of a light meal Chef Tateno will prepare to show how yuzukoshō can be used. 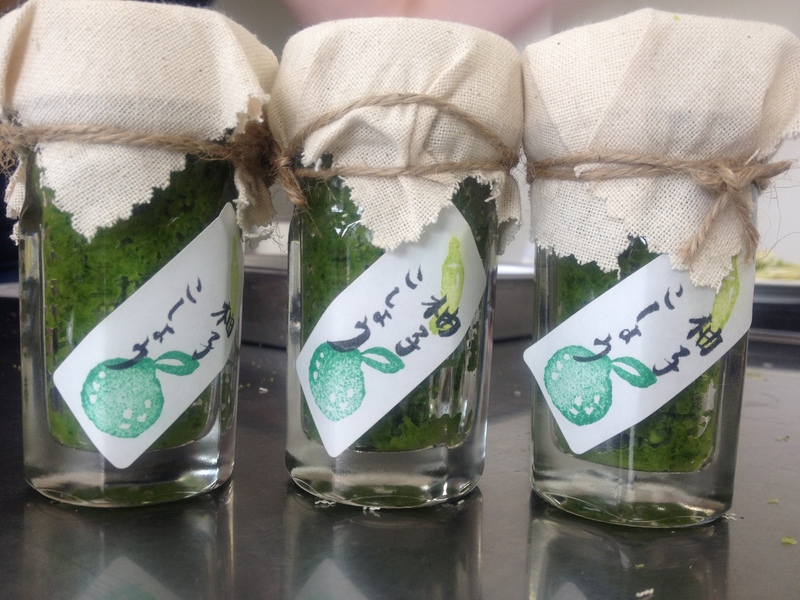 If you joined us last year, come out again to make a batch of yuzukoshō for the coming year and taste new ways to use this condiment, which captures the very essence of summer in Japan! Participants will take home their yuzukoshō in bottles we will provide. As the process of making yuzukoshō can release overwhelming pungency, participants are advised to bring a mask of the type Japanese commonly wear in the winter. 2) Sign up at .